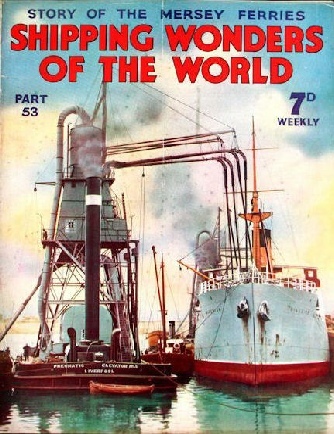 Part 53 of Shipping Wonders of the World was published on Tuesday 9th February 1937. 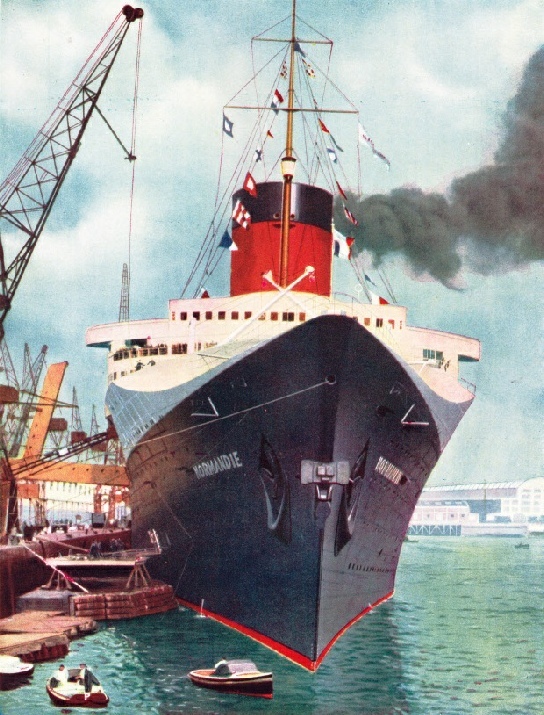 This issue included a colour plate illustrating the French liner Normandie. It formed part of the chapter on The Modern Ship’s Maintenance. This plate had previously appeared as the cover to part 30. The plate was attached to page 1677 of this part. 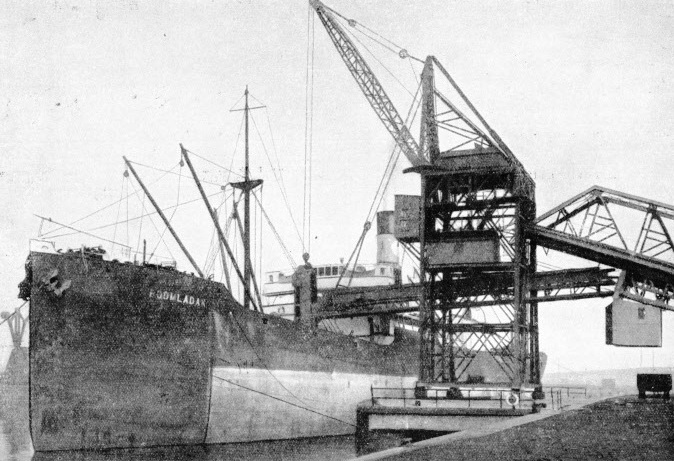 Famous for its exports of coal, Cardiff owes its importance to the proximity of the coal-fields of South Wales, and to the enterprise of the men who, having built the docks on the foreshore, brought steam coal from the mines and shipped it to every part of the world. This chapter is by Sidney Howard, and is the seventeenth article in the series on Great Ports of the World. The debit side of the shipowner’s accounts includes many heavy expenses of which the passenger knows little. The interior and the exterior of the ship must be frequently examined and all deterioration made good. Maintenance of the machinery alone entails a huge expenditure. This chapter is by Frank Bowen. A sudden emergency is often the supreme test of the quality of seamanship, although the ordinary routine work in the handling of a modern vessel demands a high standard of efficiency and reliability. Seamanship is a comprehensive term, and includes knotting and splicing, boat work, helmsmanship, and so forth. This chapter is by Frank Bowen. 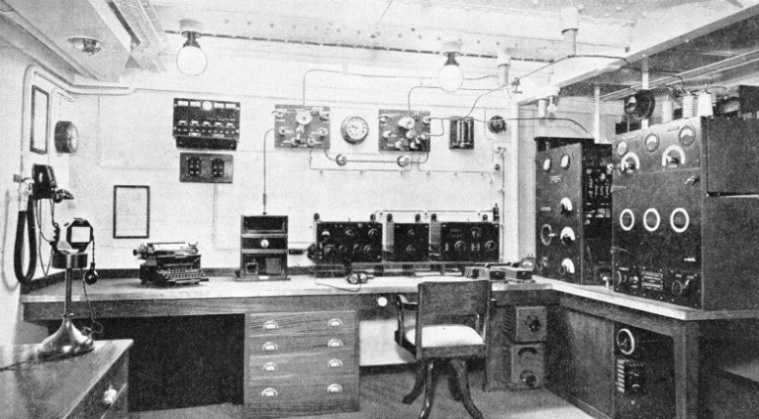 Wireless is no longer regarded merely as a means of summoning assistance in an emergency. It is an invaluable aid to navigation, and its use does much to reduce the possibility of accidents. It is still the principal means by which a ship can communicate beyond her visible horizon. This chapter is by L H Thomas. Some of the most efficient ferries in Great Britain, if not in Europe, ply across the River Mersey with a regularity that even fog rarely disturbs. The vehicular ferries linking Liverpool with the Cheshire shore are of a type rarely seen elsewhere. Users of Queensway - better known as the Mersey Tunnel - will know how much time is saved by not having to wait for the vehicular ferries. The tunnel, however, is available only for commercial vans and for private cars, no buses being allowed to go through it, and a vast army of people whose work is in Liverpool but who live on the Birkenhead side of the river still use the passenger ferries daily. It is therefore imperative, in the interests of these workers, that the ferry services should be run strictly to schedule, and their time-table is adhered to in all weathers. The crossing occupies several minutes, and on a choppy day it is not difficult to imagine oneself out at sea. This chapter is by Peter Duff. of 10 ft 6 in. 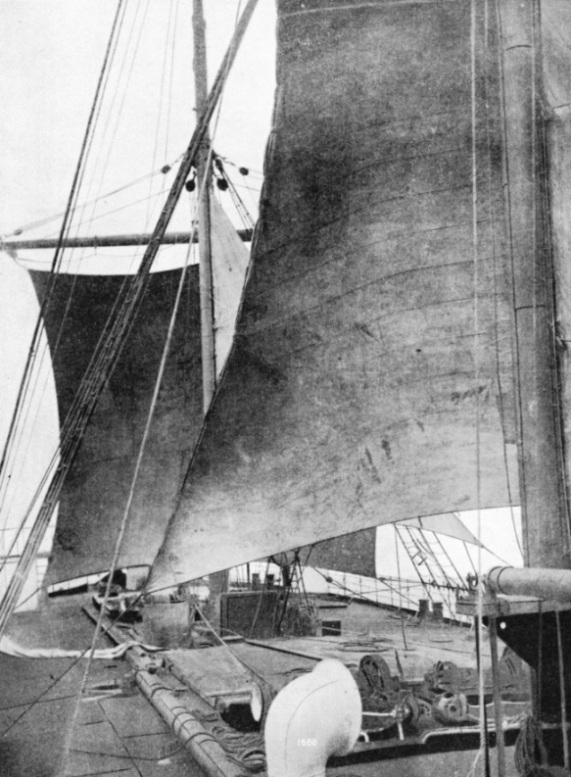 She proved such a useful vessel that the next two ferry steamers, the John Herron and the Pansy, were built on similar lines, but with raked mast and funnel. 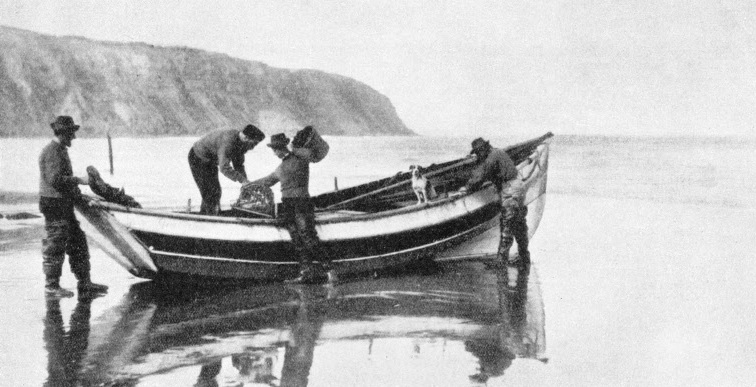 The Pansy, of 332 tons gross was lost in Bull Bay, Anglesey, during the war of 1914-18. The combination of the boat-builder’s art and the seaman’s skill has produced a wide variety of open boats. Each is adapted to the particular conditions with which it has to contend, and many of the most primitive types still survive. This chapter is by Frank G G Carr, who has made a special study of this subject. The article is concluded in part 54. This illustration was previously used as the cover for part 30. 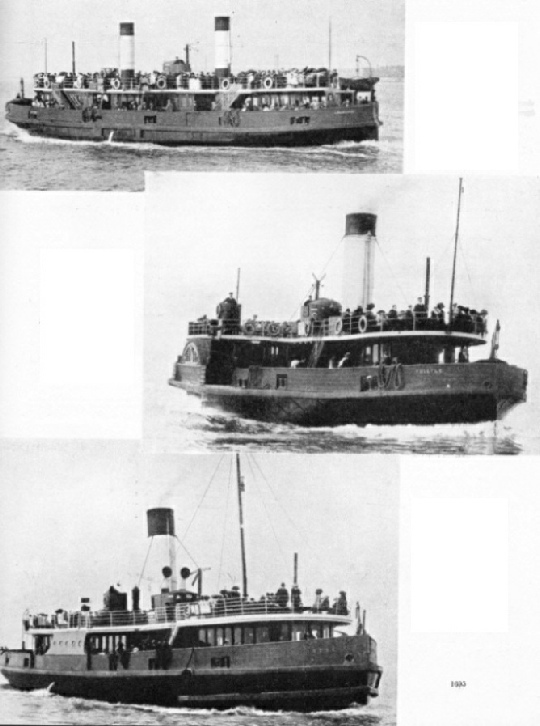 “TWIN SCREWS FORE AND AFT propelled the Snowdrop (top) and her sister, the Crocus, which were the first screw-driven vessels introduced to the Wallasey ferries. 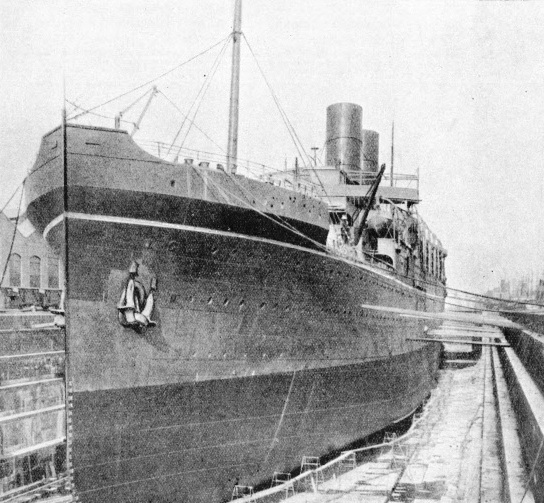 Built in 1884, the Snowdrop, 300 tons gross, had a length of 130 ft 11 in, a beam of 35 ft 3 in and a depth of 10 ft 7 in. The upper deck was built over the saloons and did not extend to the full beam. Either ship had accommodation for 1,303 passengers. These two vessels, with their straight funnels placed fore and aft, did not have a great speed and were rather ungainly in appearance. 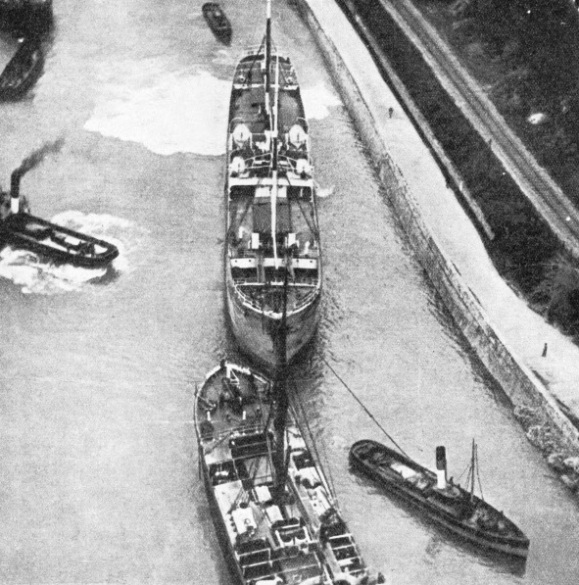 Because of these defects, a number of later vessels were propelled by paddles.